The Edelman Trust Barometer version 2011 came out recently and buried in the presentation deck are 2 slides I want you to check out. 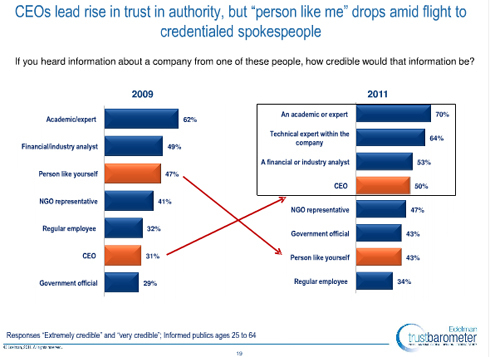 What this slide is implying is that consumers no longer trust their peers and that they would prefer to trust an authority figure like a CEO. Why is that? Call it the re-emersion of the authority figure. The authority figure exudes a sense of influence and trust and the people that are like you, can be influenced, and your trust in them is diminishing. Trust in leaders, their leadership, and their experience is growing. Does this surprise you? Ironically we have said on many different occasions that consumers look to each other for product and company recommendations-they trust each other for their unfettered honesty. So what is happening? Why is it slipping or the pendulum swinging the other way? Consumers trust search results when doing research on a company and not social media. Look where social media sits! Meanwhile search results are tied into real time social. So search may be the research conduit but the result still might a social media generated one. Either way, a brand or company can say all they want about how search doesn’t affect sales or performance-I would beg to differ especially after viewing this slide. It surprised me. Did it you? The bottom line. Search and social will still be prime components of trust but at the end of the day, who you are is going to determine levels of trust. Below is the complete deck for your viewing pleasure. Guess we better start looking at influence and authority some more. This entry was posted in edelman trust barometer and tagged edeleman trust barometer 2011, Search, social media, trust by marc meyer. Bookmark the permalink. Good catches in an also-good 25-slide deck! As to Slide #2, it doesn’t really surprise me. While you and I and others are deeply embedded in social media for almost everything we do, the real world…not so much still. Post a photo to Facebook, comment on someone’s post, Like someone else’s photo, etc. Social for social, not for search or for news, etc. YET. I do believe that real-time search will become more and more popular. So when I hear helicopters buzzing over head – is it a news crew? a SWAT team chasing a suspect? etc – I’ll reach for my phone and do a quick search on Twitter or whatever tool is the best one, for my town “Coral Springs” to see what someone has tweeted or posted about the situation, if they have. And they usually have. When I hear yet another story about Brett Favre’s millionth comeback, a simple real-time social search will give me the better chance of getting a link to a hot-off-the-presses news story than a Google search will. Yo Mark – actually statistic on social vs. search for is a bit surprising, although when you really think about it, the number of consumers actively using social media to make their purchase decisions pales in comparison to those using search. While social community is cool to be part of and is in a ‘maturing state’ – many of the participants are intoxicated with all the strawberry kool-aid being served up in the conversation. Cheers to you and thanks for the great resources in this post. Marc – good read. I wonder if the “re-emersion of the authority figure” could be tied to overall macro-economic trends within the US. Research shows that people’s level of risk tolerance decreases in tougher economic times. Most people would view expert advice as a less risky option than peer advice. I wonder if this trend continues as the economy strengthens. @Ryan That’s an interesting point about risk tolerance. When things get tough, the advice and direction should be coming from someone who has been there. Not from someone who has never faced adversity. Think about it, when times are good, people take chances and risks and listen less to sage advice…There might be another blog post to follow up on this thought. @mark Couldn’t agree with you more. and thanks for reading again. @Pat Always good to have your thoughts. Thankyou. But don’t Google search results lead with real time social results? Marc – Nope, not in the slightest. What version are YOU using?…maybe I need to upgrade. Marc, thanks! I use Google’s date-range tool often, but I didn’t even KNOW about /realtime – and it’s exactly that type of search that I think will grow, yes (but as of now, google search results don’t lead off with real time search results…unless you’re aware of that function). 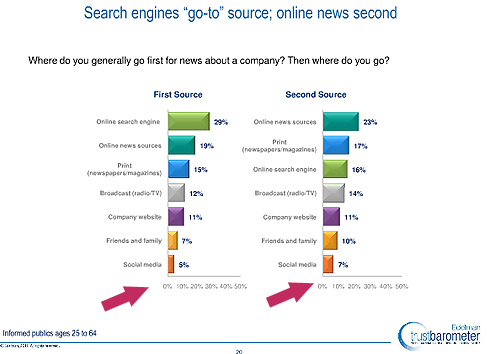 So to your Slide #2, online search engines would continue to be a top source of news updates if they incorporate and curate real-time results in an effective way. But if social sites get better at producing results and even more people get onboard, they’d rise from the bottom of the pack. Thanks for the heads-up!